While there, Patel conducted extensive research on technology that has been flagged as potentially disruptive – such as artificial intelligence, quantum computing, gene editing, and smart cities – and crafted reports on how and why these technologies could impact U.S. foreign policy. She even attended interagency meetings at the White House on the topic of a financial database technology called blockchain. 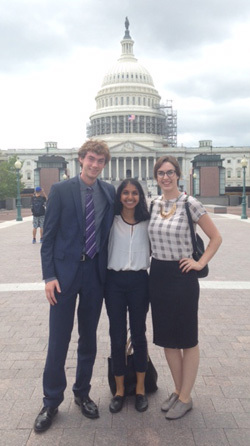 Patel became aware of this internship during a previous trip to Washington: the Park Class of 2018 Learning Laboratory II. With a focus on the United States’ role in addressing infectious disease both domestically and internationally, Patel and her classmates met with the State Department’s Sapana Vora and Andrew Hebbeler. Vora, an AAAS Science & Technology Policy Fellow (whose brother is Saket Vora ‘07), made time to speak individually with Patel about the fellowship and its managing office, STAS. 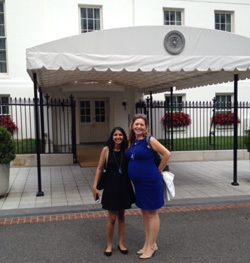 Later, when Patel applied for the State Department internship, Andrew Hebbeler – a senior science, technology, and innovation adviser – reached out to provide additional information and assist with her security clearances. 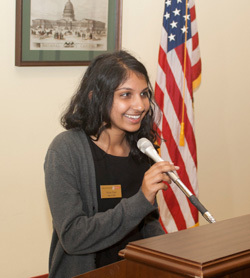 As an entering freshman at NC State, Patel contemplated a career in law. She was intrigued by the roles both engineering and the democratic political process play in improving society, particularly humanity’s attempts to solve grand challenges such as space debris and costly, inefficient air travel. She credits her Park Faculty Mentor, political science professor Steven Greene – who advised Zack Hester ‘11 and other policy- and engineering-minded students – for helping her align her interests with potential academic and professional paths. Similarly, Scott Ferguson in the Department of Mechanical and Aerospace Engineering has encouraged Patel to consider developing her own research project exploring public policy implications of aerospace-related topics. In addition to expanding her knowledge base within her major areas of study, Patel has spent the first half of her NC State career building her leadership skills. The summer following her freshman year, she worked as an assistant team lead at a Charlotte-based engineering camp for elementary and middle school students. Passionate about service and travel, she participated in Alternative Service Break trips to Guatemala and Nicaragua – the latter as a team leader – focused on gender inequalities, poverty, and housing. She also serves on committees with the Student Conduct Board and the Krispy Kreme Challenge. Patel places a high value on her Park Scholarships experience.